For anyone happening by midstream, this week I am featuring the fragrances of the London boutique Ormonde Jayne. Earlier this week, I posted an interview with Linda Pilkington, Ormonde Jayne’s founder and owner. Today's fragrance is Frangipani Absolute, and the notes are linden blossom, magnolia, lime peel, white frangipani, jasmine, rose, tuberose, water lilies, plum, green orchid oil, amber, musk, cedar and vanilla. Frangipani, by the way, is also known as plumeria, or sometimes West Indian jasmine, although it is not related to the jasmine family. When my set of samples arrived from Ormonde Jayne way back in December of 2003, Frangipani Absolute was the last fragrance I tested. At that time, I had not yet developed much of a taste for floral scents, and the tuberose alone was enough to frighten me off. As it turned out, the Frangipani was far and away my favorite of the line. The opening is very rich, but the linden and a lovely, true note of lime peel temper the sweetness; it perhaps verges on heady for a few minutes, but it is never cloying. It soon takes on a fresh, green quality, and just a bit of creaminess from the magnolia. The frangipani, jasmine, and tuberose are bright rather than heavy; I cannot make out the rose at all. There is something slightly watery or aquatic — perhaps the water lily — and something else gorgeous hiding in the florals that I assume is the green orchid oil. The dry down adds hints of vanilla and musk. Sometimes I can smell the cedar, sometimes I can't. For a short while, there is the vaguest hint of something resinous that must be the amber. It smells tropical, but fresh, like a greenhouse right after the flowers have been watered, with just the right number of windows left open. It has good lasting power, and stays bright straight through to the end. I assume that it is already patently obvious that I have a slight problem with fragrance addiction. At times it is fun, as a kind of parlor game, to try to pick my favorite 10, or 20, or 50 perfumes, but the real truth is that just thinking of actually paring my collection down to a finite number makes me break out in hives. So I will not go so far as to say that Frangipani is my favorite perfume, but it is certainly up there in the top ranks, and I would be very, very sad if I could never smell it again. Ormonde Jayne Frangipani Absolute is available in 50 ml Parfum or 50 ml Eau de Parfum; matching body and home products are also sold. For buying information, see the listing for Ormonde Jayne under Perfume Houses. Note: top image is untitled (but part of flowers: set) by frumbert at flickr; some rights reserved. Frangipani is a GORGEOUS summer scent. I wore it everyday on my trip to France last summer and it brings the 15th century house we stayed in, and Burgundy's cobalt skies, to me immediately upon sniffing. Can't wait to wear it again. Blog on, chere NST ;D.
Hello dear Robin! I am following your OJ week subconsciously or not as the case maybe – I am wearing the stunning Frangipani today. It is a sparkling happy fragrance to me – rather flirtatious with the wearer because it is always playful – I sniff and bit and feel so happy that i am wearing it. I love it and am so enjoying this again after a few months. Great perfume and like you I will be very sad if any of the OJs are discontinued in the future. I'm really starting to crave these, and I don't want to want to! I was able to try Ormonde, and I am really intrigued by it. Great series, R! What nice memories, L! Your mural is looking stunning, by the way, and I do wish you would come paint one in my house. N, the nice thing about the smaller houses is that hopefully, they don't discontinue as often. I am disgusted with how many of my favorites by larger lines are now discontinued. I put off trying that one forever, too, because I've been so disappointed with frangipani-based scents in the past. But it's undeniably one of the most gorgeous florals ever made. Frangipani is gorgeous. It is bright without being sharp, with a soft creaminess. In the warm climate where I live, it would work as a year-round fragrance. I prefer it over OJ Osmanthus, which is very pretty but a bit boring. T, if you wander back through, I'm curious to know what else you've tried. The only others I've tested are the Terranova Plumeria & the Chantecaille. Envy you the warm climate! I cannot claim the same, but I wear it year round anyway. Oh, Robin, how I wanted to love this one! Frangipani is my favorite, and I mean favorite, tropical bloom. But alas, the OJ version was a big disappointment. I guess it did not smell “tropical” enough to me, and that is what I was craving. However, your beautifully descriptive review makes me reconsider my opinion on how frangipani “ought” to smell. I may pull out my sample again and test with a more open mind. Thank you for writing about it, because I always love reading your reviews, darling! Ahhh Frangipani, the only bottle I own … so far. A beautiful fragrance with indeed a watery feel, which makes it cool and fresh. Thank you R! 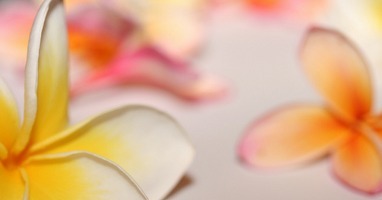 Please tell me what Frangipani fragrances you do like? As I wrote above, the only others I've tried are the Terranova & the Chantecaille. Which do you think you'll buy next, V? I may well order a bottle of Ta'if, but my Frangipani is also running dangerously low. It will be a hard decision! I don't know, I want 4 of them!! Maybe Sampaquita. But I might split a bottle of Tolu with a friend. Lord help me if I ever make it over there! I love Terranova's frangipani and I have worn the Chantecaille one off and on since 2000 maybe? Celine has a new fragrance coming out called Fever. The notes are blood orange, mandarin, frangipani, egyptian jasmine, amber and vanilla. Can't wait to try that one! V, I didn't know you hadn't tried them! I think Tolu is the only one I am immune to. But then, I haven't tried it in a very long time…perhaps it would grow on me now too. But I just checked out her website and it is an intelligent and substantial website, informative but not alot of frou-frou, which is just how she came across in her interview. Thanks R, will have to look for it! Yes, Serge will pretty much drain your bank account. OJ has the advantage of having fewer fragrances to drool over. Miss F, Your very kind words are appreciated as always! Should I even ask if you had sniffed it first? And Phil doesn't know where I live, right? Yes my dear! I've had the sample set for months. I just hurriedly tried a few when they arrived, and since I wasn't immediately enthralled, I set them aside. I probably tried the Ormonde and the Champaca first, which are the two I like the least. So much later when I brought the set out to try the Ta'if, and others I was so surprised to fall in love with FIVE of them!!! Now I am in BIG trouble! At one moment I had four in my shopping cart and was just about to push the button! I barely escaped that one! Well V, five is a lot. The recovery of the dollar is our only hope! I had forgotten completely!! Well, a man who is nice enough to mail his wife's packets surely won't come after me, I suppose. Suddenly wondering what duty free opportunities you will have on the way to the Philippines — Vetiver Pour Elle?? Your review of OJ Frangipani is absolutely “spot on”. From the “lovely, true note of lime peel” to the “tuberose alone was enough to frighten me off” to “I cannot make out the rose at all”! Third is the third OJ that I tested, after Isfahan and Ormonde men. This is my favorite so far. The fragrance seems to be all that it wants to be. There is so much to discover with this one. Hi John, I am so glad you appreciate this lovely fragrance as much as I do! It is the one I usually recommend to friends who ask me what is out there that doesn't smell like everything else. What did you think of Isfahan? I like Isfahan. It is dry, woody, and masculine. Since Isfahan was reminding me of SL Chene throughout the day, I applied Chene at night. If it wasn't for Chene, Isfahan would probably be on my buy list. Chene was more powerful, complex, and beautiful! I must say that Serge Lutens is my favorite house. SL is heavier than OJ, but OJ is rich. Since Linda was kind enough to send an extra sample, I will apply Isfahan heavier next time and see what happens. John, Interesting, Chene was one of the few Serge Lutens scents that did not make any big impression on me one way or another. Perhaps I need to try it again! Chene did not make a big impression on me either when I was testing the SL non-export line. I enjoyed Un Bois Sepia, Fumerie Turque, and Encens et Lavande much more. I like some sweetness, and Chene did not have any, but I did not dislike Chene. The comparison to Isfahan helped me to appreciate Chene. And it has a lot to do with chemistry, taste, and the moment. I have to have this. I have resisted. I am, I always thought, the classic “white floral hater”. My husband transcends this label to be classified as some sort of anti-white floral Nazi, dear man though he is. Can't help it, though. This was the first in my package of Ormonde Jayne samples to be used up. I applied it only when alone and sure to be alone for several hours. I argued against my joyous response to it. I never wore it in company, afraid it might offend. First I bought the Serge Lutens Douce Amere. Then the Ormonde Jayne Ta'if and Champaca. All the while I wistfully told myself that I really could not wear the Frangipani anywhere but in the privacy of my own lonely room. Maybe I can live with that! It is such a joyous scent, so not surprised at your response. It doesn't hurt to have a few fragrances that are for you alone and that you don't wear in public — actually, I have a whole cabinet of such things! My husband and I were in London last week and I just visited the boutique on Bond Street. It was between this and Ormonde Woman and he liked Woman best. I have to say the first fragrance is much more unusual than this one. However, I walked out a bottle of both because I won't be back in London anytime soon! The boutique is cute but very small! Robin, I now have the sample kit and have fallen in love with the Ormonde Jayne line. I now know why you hold it in such high regard. Do you know, by any chance, how the perfumes compare with the eau de parfums? I see the difference in price isn't all that extraordinary. . . Agreed! Eminently practical advice. Thanks, R! oh! I think the flower in the picture is frangipani? When i was a little girl (4-5 years old), i always waited for my school bus in a street corner near my home, where there was a frangipani tree (or its relative that looked so alikei). The smell of flowers when they blossomed was so gorgeous that i can even remember vividly now. My mother told me the flower was called “egg flower” as it looks like an egg yolk surrounded by egg white! Sadly these aromatic trees are disappearing mysteriously here, but once in a while when I walk pass one I couldn't stop myself from staring up and sucking in as much air as I can! I wish I can sample this one and also others in OJ line during my trip to London in Nov (finger-crossed: please let me go to London dear boss!). Thanks again for opening the world of perfume for me! I am still working through my sample set, and when I reached Frangipani was rather excited as i had read about how Robin loves it so much. If it is one of Robin's favourite perfumes ever, then it must be special. Wow, was it! It is one of the loveliest, most delightful, succulent, pure, fresh scents ever. It is the first perfume I will reach for on my wedding day. Whenever that happens! Very late reply — sorry I missed your comment somehow! Did you get to sample it yet? You know, I always think of it as the perfect wedding perfume too. So glad you love it! Just tested Frangipani today, and it is gorgeous. Visited Hawaii a few years ago with The CEO and have to say that sniffing this on my wrist put me right back there again, in our little mom-and-pop hotel on the Big Island, complete with koi pond and plumeria trees outside the window and geckos popping in and out of the cracks around said window. (The CEO freaked out and nearly threw the phone book at one, but I stopped him.) Black sand beaches… the smell of rain in the air… orchid leis… Really beautiful. Dear Robin, please help me: it is you who tickled my curiosity with the OJs! Well, now I think I fell hopelessly for Champaca and Frangipani absolute! The latter is growing on me at every wear. Up to day, have you ever compared the EdP with the Perfume conc.? I suppose that the simple fact of dabbing the latter should change the perception very much (all white flowers do that trick to my nose: Songes is the most striking example on how remarkably the jasmine note – and the perceived jasmine/vanilla ratio – mutes depending on the kind of application). I’m wondering which conc. to buy. By instinct, I would say the perfume concentration should bring forward the basenotes a bit (providing less sillage and better lasting power), dimming the peppery accord and the perfume-y feeling. This would be all right. But I fear this would dim the gorgeous lime peel and the beautiful white bouquet opening. What do you think? You know, I’ve never tried any of the OJs in extrait because a) already VERY happy with the EdPs, and b) they’re very expensive and c) I’ve heard they’re lovely but not so lovely that you ought to feel you’re missing something with the lighter concentration. So, I’ve decided best not to know any more than that. Sorry not to be any help though! I feel quite silly for being so late to the Ormonde Jayne party, but I need to squeal girlishly for a moment, so please bear with me. Robin, after reading your delicious reviews of the OJ oeuvre, and then having Chandler Burr egg me on when he described Ormonde Man as smelling of compassion, I rather feel as if I’d fallen madly in love with the line before I’d even tried any of them. Having lost my head entirely, I ordered the tantalizing sampler set which arrived in record time (and let me digress by saying how utterly exquisite the Ormonde Jayne website is – it immediately makes you want to brush the toast crumbs off your lap and sit up straighter, doesn’t it?). Having read about the pleasure you get from Frangipani, I knew it was the one I wanted to try first, and oh my nose! It is even more addictively lovely than I’d imagined. I have woefully little skill in picking out individual scent notes, so I hope it will suffice to say only that it is the kind of perfume that, as you reach for a pen, so captures your attention that you suddenly realise that you’ve been sniffing your wrist for ten minutes and are starting to look deranged. Apart from the glowing florals, I definitely get a whiff of cedar, but it’s not the insistent, loud-mouthed cedar of moth blocks. It’s something much gentler and has a warm kindness to it – the kind of note that you never realised how much you loved until you met it in this incarnation. I’m genuinely enchanted. All those other sweet little OJ samples are jiggling about in their case, waving for attention, but I can’t move on yet. I know I’ll get to them in time, but I’m enjoying my Frangipani monogamy too much right now to be interested in anything else. I just love who I am when I wear Frangipani. Do you know what I mean? So glad you love Frangipani as much as I do! Frangipani even makes me want to brush the toast crumbs off my lap, LOL…it’s so much prettier than I am. Have you tried any of the others yet? I agree this is a very nice, light floral. It did fade fairly quickly on me, though. I have to admit, it really reminds me of a scent I had in like 9th grade…I can’t remember which…but there was one called Sunflowers and one from Bath and Body Works in a little blue checked box called Gingham. It smells very similar to what I remember one of those being like. I have been debating on trying the OJ Woman…It got hightest marks from Tania/Luca…. Sorry for the very late reply, somehow I missed your comment entirely! I do remember Sunflowers, but not the other. And do try OJ Woman, it’s a great scent. This is stunning – what an opening! And the dewy freshness of the floral heart…Did remind me a bit of DK Gold…will try them side by side…Thank you so much for putting me onto OJ with your lovely reviews…Howsabout doing the ones tyou haven’t done yet? It must be most of them. The others didn’t interest me so much, although the new Tiare has lots of fans. For me it is more about linden blossoms. And grapefruit – maybe the combination of lime and the verdant undercurrent. Frangipani had, on me a remarcable longevity. I sprayed it on my wrist yesterday at 5 PM and this morning the tarty-creamy-plum drydown was still noticeable. I need a bigger sample or a split… The best would be a FB… but no budget for it… THAT is heartache….